Can you kayak the Panama Canal ? Certainly you can paddle anywhere in the canal; except, on restricted areas such as locks and main ships navigation channel which is marked with buoys. One of best Panama Kayak Adventures is our trip to kayak on the Panama Canal. The Panama Canal is much more than a marvel built to transit vessels from one ocean to other. With it, a vast zone of tropical forest has been devoted to protect its main resource: fresh water. Namely Soberania and Chagres National Parks. We take you to explore this wonder in expedition kayaks to allow you a close encounter with the nature that surrounds it, our treasure that makes it possible. Every time a ship crosses the canal towards the Pacific Ocean at Miraflores Locks or towards the Atlantic Ocean at the Gatun Locks 52,000,000 gallons of fresh water are spilled from Gatun Lake. It used to be the world biggest artificial lake. With the creation of Gatun Lake many mountain tops were turned into islands. It offers endless channel possibilities to scout. 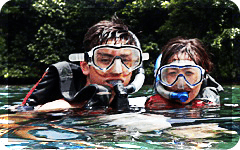 In its shores covered by dense tropical forest you will find all kinds of tropical flora and fauna. This was discovered by the Smithsonian Tropical Research Institute which operates the famous Tropical Research Station of Barro Colorado since 1946. This tour begins by picking up guests at Panama City around 8:00 a.m. We will drive along The Panama Canal, passing by Miraflores and Pedro Miguel locks, arriving at Gamboa Public Ramp, 40 minutes later to board a motor boat that will take us north along the Panama Canal in a one hour long trip to our destination, to start kayaking around 10:30 a.m.
After about an hour scouting channels throught the tropical forest in search of wildlife we will have lunch in our motor boat and time to relax before further exploring the area in our expedition kayaks. Monkeys are almost guaranteed to be encountered. Among them: white face (capuchino), howling, spider and titi. Sloths are also common. Birds such as king fisher and fishing eagle are also common. If lucky we might spot reptiles such as cococriles and turtles. Lizards running over the water, Jesus Lizard, are very common also. We should be back to your pick up place around 3 - 4:00 pm. WHAT DOES IT INCLUDE ? All mentioned transportation, expedition kayaks and related gear, guides, and meals. 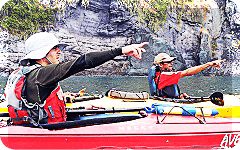 Our guides are trained in kayak navigation skills, first-aid and CPR. WHAT SHOULD YOU TAKE ALONG ? A pair of shorts for navigating, sneakers or straped sandals, a cap, sun-block, a light jacket or windbreaker (in case of rain), a towel and an extra set of clothes for the trip back. This is a year-round Panama kayak adventure. Join us to kayak on the Panama Canal kayaking tour.